I use a couple of different type of food bowls for our chins. Stainless steel bowls that fit into a ring that attaches to the side of the cage are good if you happen to have a chin that likes to tip his food bowl. Ceramic bowls/crocks are another option which I use. Where should I place the hay? Believe it or not, that is a big question for chin parents. You can put the hay in a large heavy crock, leave it loose and set it on a marble or ceramic tile, place it on a shelf or in a hay rack. You can also use a small ceramic flower pot (the ones that are flat on one side). We use a couple of these and they work well. Here lies the problem. 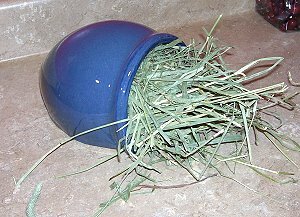 Some chins will pee on hay if it is in a bowl, yet many will not. If you put it in a bowl, some chins will just pull it all out as soon as you give it to them. If you choose to use a hay bin, it needs to be one that you attach to the outside of the cage. This works better if you have wire spacing that is 1" x 1" so the chin can get to the hay easier. If you do use an outside hay bin, you must overstuff it and push through as much hay as you can as a starter for the chin to be able to get to it. Do not use a wire hay manger or hay spinner as chins have gotten their legs/feet caught in them. You also do not want to use a plastic hay holder. Chins will chew these and they can't really get to the hay. Most chins would never think of peeing on their hay or wasting any of it, but the bottom line is you won't know until you see his behavior for a few days. 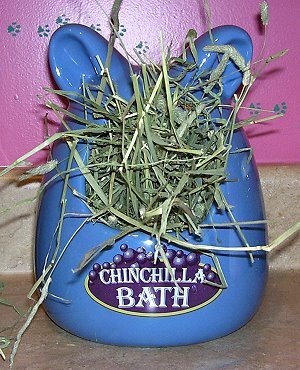 These ceramic chinchillas baths are very cute and great for stuffing with hay. I also put a pile on an upper half wire shelf. We have very little waste because if any hay falls through it goes onto another shelf where the chins can still eat it. I have also found that they don't pee on it when we do this. A large complaint among new chin parents is the mess of the hay getting outside the cage. This is all part of living with a chin. There is no way of keeping every bit of hay inside the cage. So be aware of that before you consider getting a chinchilla. Even putting it in a bowl does not guarantee that all the hay will stay in the cage. You can find a couple of people that make wooden hay bins that are very nice and do the job of holding the hay, but since they are made of wood they will also be chewed by the chin. That is fine since they are usually made of pine wood, but how long it lasts depends on how much of a chewer your chin is. You should have a small separate bowl to give your chin treats. Never put treats in your chin's food bowl. They will quickly learn to dig through their pellets looking for treats thus dumping and wasting their pellets. This will also create a picky eater.